For those who don’t appreciate how closely the horror genre is tied with social and political commentary, Ishiro Honda’s Godzilla is all of the evidence needed to make an airtight case. The fact that Godzilla is a creature feature simply allowed for easier accessibility to audiences, both nationally and internationally, giving it a wider audience base for the poignant and timely horror story. This Japanese film is a cautionary tale about nuclear weapons, made in a country which had itself been ravished by the atom bomb during World War II. It is both ironic and fitting that Godzilla would also be released in 1956 as Godzilla, King of the Monsters, in the very country which had been responsible for the devastation of Hiroshima. The fire-breathing creature from the Jurassic period is awakened by H-bomb testing in the ocean, baptized in the waters of nuclear destruction and seemingly immune to the arsenal of humanity. As though Pandora’s box had been opened by the H-bomb tests, Godzilla wreaks havoc on the city that lay waste to civilization in a manner which looks familiar to the wreckage of Hiroshima. Even more fitting is the fact that Godzilla carries radioactive fallout in his path, making ill those who survive his path of destruction. This is far more than the camp of bad monster suits and the 28 sequels which became of the Godzilla franchise. This first film is a masterpiece, and one which was just as relevant as it was popular. 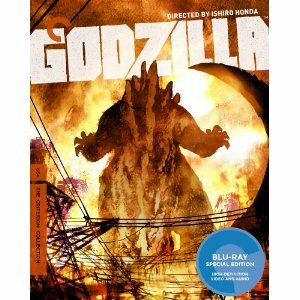 Part creature-feature in the tradition of King Kong and part thoughtful and emotionally resonant melodrama about the difficult decisions which come with the creation increasingly destructive weapons, Godzilla is a complete picture. Just the same, when it was “Americanized,” Godzilla was completely re-cut with new footage and a superimposed American character, played by Raymond Burr. This comical manner of bringing the classic to Hollywood set the stage for the camp of later decades, but there is still a great deal of emphasis on nuclear destruction and fallout within the storyline. The high definition presentation of Blu-ray is somewhat of a double-edged sword, especially in terms of the effects. Although there are some undeniably effective sequences, it becomes easier to see the man within the monster suit in a few key shots which are enhanced in this pristine presentation. Not all of the images are perfect, however, as some have been worn down from years of use and are filled with irreparable scratches. The real highlight of the high definition is the sound, specifically Godzilla’s signature roar which is compiled of sound clips from an assortment of military arsenals. The Blu-ray includes both a high-defintion digital restoration of Godzilla and Godzilla, King of the Monsters. Both films have an audio commentary by film historian David Kalat, and there is also an illustrated audio essay by historian Greg Pflugfelder and an interview with Japanese film critic Tadao Sato. The package also has an insert booklet with an essay by critic J. Hoberman. And what a package this is, even containing a pop up Godzilla as the sleeves are unfolded. Additional special features include a number of interviews, both new and old, and a featurette about the effects within the film.